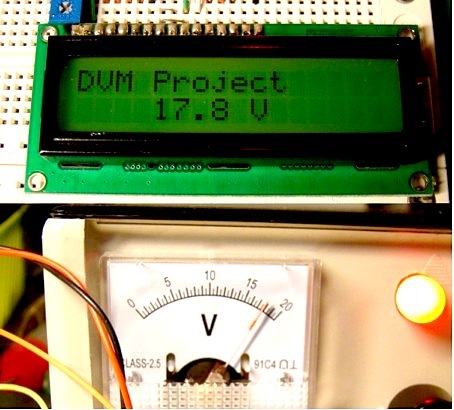 This project will describe how to make a simple digital voltmeter (DVM) using a PIC16F688 microcontroller. The range of this DVM is 0-20V, but you can easily increase or decrease the range of input voltage as your requirements after you understand the voltage scaling method described in this project. The PIC micro reads the input voltage through one of the 8 analog channels and convert it to a 10-bit digital number using the internal ADC. Doing some math with ADC conversion (you will see later), this number can be converted to the actual measured voltage. The voltage is displayed in an HD44780-based character LCD. You cannot feed a 20V signal directly to a PIC microcontroller’s input channel. It is too higher than its operating voltage, and the microcontroller could be damaged. So, first we need a voltage scaler that will scale down the input voltage to the safe operating voltage range of PIC16F688. It can be achieved by a simple resistor divider network shown below. Using two resistors, R1 and R2, the input voltage ranging from 0-20V can be down converted to 0-5V. For the chosen values of R1 and R2, you can see that the output (Va) from the resistor divider network is 1/4th of the input voltage. If the input voltage goes beyond 20V, Va will exceed 5V, and this could be harmful for the PIC microcontroller. If you connect a 5.1V Zener diode across the R1 resistor, the output voltage Va will never exceed 5.1V. This will protect the microcontroller from any possible damage due to high voltage input. The voltage Va will go to AN2 (pin 11) channel of the PIC16F688 microcontroller. The rest of the circuit is shown below. The LCD display is connected in 4-bit mode. If you have just 14 pins in your LCD module, then you may not have a back-light facility and you can ignore the pins 15 and 16. The contrast adjustment is done through a 5K potentiometer connected between +5V and Gnd. 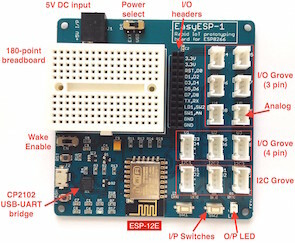 An in-circuit serial programming (ICSP) header is provided so that you can easily upgrade the firmware inside the PIC microcontroller in future if you make any changes. An external reset is helpful to bring the entire system to a known initial condition, when the microcontroller stops executing the program for some reason. The complete circuit built on a breadboard is shown here. You need a regulated +5V power supply for this project (Why regulated? You will find the answer in the Software section below). You can use a LM7805 linear regulator IC for this purpose (read my article Regulated Power Supply for your Breadboard). In the 4-digit product (0462), the first two digits are the tens and units digits of measured voltage. and the last two are the decimal digits. So, the measured voltage will be 04.62 V. Only the first three digits will be displayed (04.6 V). The firmware is developed in C and compiled with mikroC Pro for PIC compiler from Mikroelektronika. 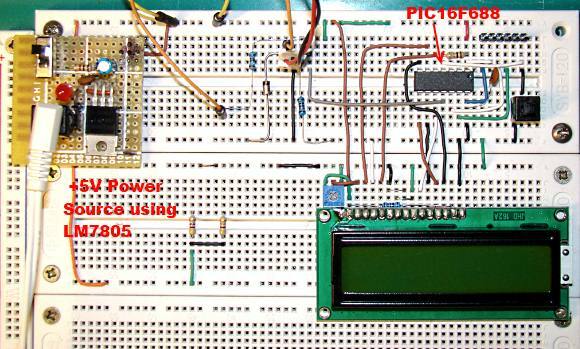 The PIC16F688 microcontroller uses internal clock oscillator at 4.0 MHz. MCLR is enabled and Power Up Timer is turned ON. You need to define RA2/AN2 input as analog by setting the corresponding bit in ANSEL register. VCFG bit of ADCON1 register is cleared to use Vdd = +5V as reference voltage for AD conversion. ADCON0 = 8 connects the AN2 input channel to the internal Sample and Hold circuit. Comparators on ports A and C pins must be disabled too (assign CMCON0 = 7). The configuration bits for the fuses are given below. You can set these in MikroC through Project->Edit Project. The complete program written in mikroC is given here. Here are the DVM measurement output for various input voltages ranging from 0-20V obtained through a variable DC power source. Please R-B your site has been very helpful to me. But there is something I want to understand very well in DVM program code. that %10 what does mean? why is it there? hi. i was wondering if you could provide me the code for making your LCD voltmeter into an LED type voltmeter. I have voltage divider circuit as this in many projects. 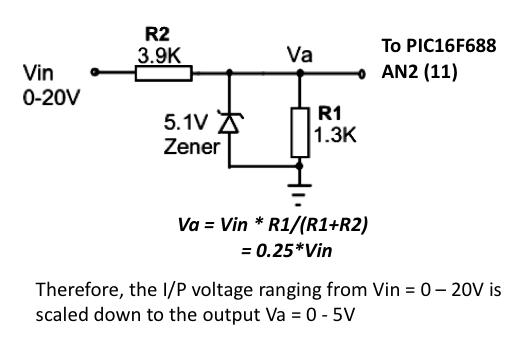 However, I always omit zener as it is almost impossible to get precise voltage with. Every zener require minimum current in order to work properly, otherwise, voltage drop is significant. With 3.9K and 1.3K it allow 3.85mA, which may be good enough for 5mA rated zener, however that is only a fraction of mA current which is usually required for commonly available zener diodes, which usually requre even 40mA in order to work properly. And that kind of current may destroy PIC (max. limit for I/O pins is 5.5V, 20mA by datasheet). This further require more expensive and less common 1-2W lower resistor values, or making it with more usually several resistors in series/parallel or both, in order to satisfy minimum required current of 40mA. However, that is not very good practice, as dissipation is enormous (1W or more) and as well require additional resistor to limit 40mA under 20mA. Thus this become unresolved chicken and the egg problem without few mA rated zener. I’m unsure how to solve this instead to omit zener completely and ensure voltage is always under maximum designed limit. Hopefully, all these are hobby projects, for my own pleasure. i want to control the 5 Leds with potentionmeter..
i want to control the 5 Leds with the potentiometer…. Pls correct me if I’m wrong. I need program in c using pic microcontroller. It must compile in microc compiler and the program title ” Resistance measurement”. it must display in LCD Displayand the formula R4=(R3xVo)/ (vcc-vo). Hi, very nicely done. I wanna know that how can one make an embedded system to measure 120 volt dc ? I am looking for some ADC but can not find it. Can you please help me in finding a solution? Thanks. Very good project, but how did you find the resistor value?? try and error? I think in this circuit you are measuring voltage drop across 1.3kOhm resistor is that right? Hey! I was wondering where in this voltage divider circuit could I connect my load… say I have a 8W bulb that requires 12-18VDC. Sorry, I am not an electrical engineer. Any help would be appreciated. will this work if i try to measure a negative voltage drop? And if not, what modifications should i do to this project so that it can also measure negative voltage drop? 1.Can i measure 220v ac supply without converting ac to dc? 2.The ground of vin 550 ac voltage are the same connected to the ground of zener diode protect the PIC? I have an application. I want to measure a DC voltage across a capacitor, should be 9 volts to start with hen a 9 volt battery is initially attached. After 5 seconds or so, it should drop to near zero. It is a crude way to see if the capacitor is good. I apply voltage, measure it to see if it is fully charged and get 9 volts dc. If I leave the measuring wires on it and take another measurement 5 seconds later, it should be near zero. I don’t want to display the voltage, just see if that process happens. If it does, I want a green LED to light. If it doesn’t, a red led will light. Its for a device buried under ground and we do not want to use a meter by the technician. If the capacitor was shorted, the starting and ending voltage would be the same. If it was open, we would get zero voltage both times. Initially, we were going to just use an LED and resistor for a measuring device. Depending on the capacitor value, the LED would light brightly and then gradually dim. This would indicate a good capacitor. The problem was we thought it might be too complicated for a field tech. We thought a red/green bad/good LED would be better. What do you think. Would this chip be good for that? I’m a new pic chip guy and have not written any code yet. I do have a programmer and breadboard. really it’s fantastic , I’m learning many thing from it. now I’m trying to do this project but on pic 18f4620 I try to write a code bus i’m facing some problem. could you please help me in that? ?and what about the circuit for project it’s still same , isn’t it ?? Please answer me as soon as u can. really love this project and wish to try it at home. but you did not give a step by step approach on how to get the bread board wired up with the components.As am a new electronic student i will be glad if you could get in touch with the steps. I will also love to buy the componets complet and try to assemble it with your guidance. I need your help on based on this project using PIC16F688,i’m working on one project which is need 3 of analog channel,i have did the hardware part and selected AN2,AN4 and AN5 which are the three channel,i had refer this project and your anther power supply project which is 2 channel,below is my coding,but it working only AN2 channel. 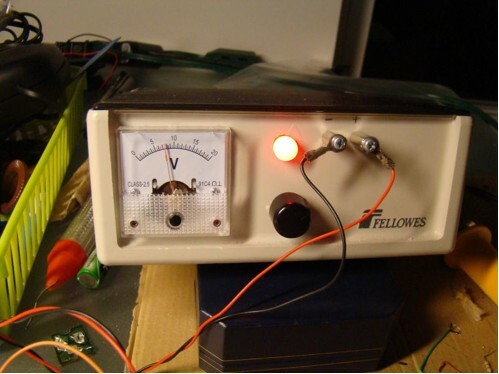 thanks just stumbled on to your excellent site (you are doing good work, thanks for your time) I need to build PIC-based Digital Voltmeter, can you make it read 3 or 4 decimals after the . ex 12.2364 v, I do slow charging of big batteries and will be nice to see them coming up slowly. What do I need to change if it is possible? I have no programming knowledge and only build projects by using hex file supplied if it is possible, if it is possible. Perhaps it is some bug in programming, because I changed one of the sampling pins from AN0 to AN3 and again to AN0, and now it works perfectly! But I have to mention that it works independently of what the ADCON0 register is set. In fact, even if I remove it from the code, it stil works! 1) What does the ADCON1 do? The reference voltage is set by the 2nd bit of the ADCON0 register if you see the manual. 2) Why are the 2 LSB of the ADCON0 set “0”? If you see the manual, on page 71, the first LSB is actually the enable bit of the ADC module and it has to be “1”! -> But as I mentioned before, there is some kind of bug, because even if I completely omit to set the ADCON0, it still works! Now I’m going to implement a current meter as another of your projects. Hope I will succeed in this! Keep up the good work! Hello. I have made many of your projects, and I highly encourage you to make more! I tried to make a dual input voltmeter using pins AN0 and AN2, based on this project. It reads from both pins, but if I connect only one of them, it displays on LCD both readings the same value! What is wrong? Please help me! Make sure there’s no short circuit between the two ADC inputs. What is your circuit diagram look like? Hi george iam impressed by your ideas can you please send the circuit diagram of this project. The problem is solved, that was my jumper shorted off!!! thank you for all your beautiful project! I am glad you finally resolved this. Sorry Marc, I won’t be able to do that today as I am going to bed now. I have a flight tomorrow for Munich, Germany. I will be there for a week for a conference, and I will surely do it after I return back. There’s no -5V in my circuit. Yes, my mistake, i have put 3.9k ohm resistor,anyway, what is wrong with my circuit pleaseee?? There’s no 3.9 Ohm resistor in my circuit. It is 3.9K ohm. i hope you will help me as soon as possible. Those resistors are not the part of the circuit, so ignore them. If you are measuring a constant 20.4V it means your analog input voltage is always 5.0V because that will give 1023*2 = 2046, which is shown as 20.4V on LCD. Make sure there is no short circuit between AN2 and VCC pin. no one can help me please? what if i want to measure 220V Ac voltage ?? thanks for sharing the project! where do i connect the + and the – of the battery to be tested? thanks! + of battery should go to Vin and – should go to ground of the circuit. dear sir yout 16f688 volt meter works ok!!! Input voltage is 0 to 20 volts and anything over the zener voltage goes to ground. Why do you take this cheap wasteful way out ? Why not suggest a purpose made chip with low currebt to ground on overvoltage . Tey cost next to nothing and are common. Hi Raj! I tried your project twice but for 0 v input it gives me 5 v and for 3 v input it gave me 15 v… i think did something wrong.. can you help me out please? Did you try this project exactly as it has been described, or are you using a different microcontroller? how can i diplay the value in lcd in my pc. basically how to interface the input of pic16f688 with pc. please can you send me the hex code, program and circuit configuration. I’m asking you if you can give me the code written in assembly code because I’m using THrsim11. Hello – I need from your help. and when i have this numbers – where in the software need to i write . Voltmeter to both shows you two tensions – how to modify the scheme and the software text ? I change the code for 2 inputs, but I don’t no if this is wright. Please can you controle code of right place. I don’t understand. Please help withe change the code for use 2 analog input. Where do I find above mentioned rotuines? Are they part of mikroC lib? Yes they are built-in routines of mikroC. while using mikroC PRO,error messages are being displayed,when i loaded the given sample programme…whts the prblem??? external 10k-vr with voltage (+1v). detail of my pic16f676 pin connection. i am use 4.00Mhz oscillator external. Very interesting project and thanks for sharing. Can you please tell me how to convert it to PIC16F628A. This project may not be repeated with PIC16F628A as this PIC does not have any ADC channels. Hello. Good tutorial. Im using PIC16f818. 1- What happened to left justified or right justified as in the data sheet for ADC. 2- How can u extract actual voltage by ‘ DisplayVolt = ADC_Value * 2; ‘. Supposedly, if the in coming voltage is 5V with Vref at 5V, the ADC_Value is 1023.. but * 2 will = 2046. Then u take that value and display on the LCD. How does this work out? 1. By default the MikroC LCD library use right justified data of ADC output. 2. If the incoming voltage is 5V, then the actual input to ADC channel after resistor divider is 0.2457*5 = 1.229V. The ADC value will be 1023*0.2457 = 251. So 251*2 = 502, which is displayed as 5.02V. i am new in programing can you please explain the following part of code. The variable Volt carries the numeric digits of the measured voltage. In order to display them on a character LCD, the numbers must be converted to ASCII equivalent, which can be done by adding 48 (30h) to actual numbers. For example the ASCII code for 0 is 48, for 1 is 49, for 2 is 50, so on. will you email me the coding sotfware in microprocessor? do you have the DVM software coding for microprocessor?? if I have an inputb of 12V-24V which circuit can I use? Thank you for sharing very good projects with us. What about an ampere meter ? HI RB a great tutorial, very informative. I have ported the DVM over to a PIC 16F690 chip and got it working as a dual channel, just one question …. I want to change the display (ie get it to flash) when the voltage reading on one channel exceeds a present voltage how can i get it to this? my need HOW CAN GET ? who is right way ? I’m calculating this math to have a 0~500V volt meter. Seems like you are doing right. Measuring AC voltage is beyond the scope of this project. I would say you do some more research on internet to find the solution for your problem, instead of waiting for my respond? i will use this configuration: 11.0592 oscillator external, 22 pf capacitor , HS fuse, and all other fuses disabled, + i will not use an lcd, is this configuration ok to suit the serial communication using the usart ?? I would recommend to read the datasheet, specially the USART section. You don’t need to change the configuration setting for using USART. You will be fine. First of all, there is no resistance on pin 14 on the PIC, so correct what you are saying. And are you using the same microcontroller and the program that I provided? Make sure that the ADC channel that you are using is defined as input in TRIS register. first of all thank you so much for your help and for this wonderful tutorial.. but i have a question please.. i configured the fuses and programmed the pic and everything in ok.. but the display is wrong so could you tell me why this happened? What do you mean by the display is wrong? Do you mean it shows wrong values on LCD? Tell me more about the problem. What is the initial display in the LCD once I power up the circuit? I’ve overlooked at my inbox. I’ve already received it. Thank you very much! Hi R-B! Thank you for the code. But I think I haven’t received it yet. Can you resend it to my email? angel_joyce15@yahoo.com Thanks! ICSPDAT and ICSPCLK are data and clock lines for in-circuit serial programming of PIC microcontroller. R-B! When I tried to import the hex file of your code on my Pic16f676 (using pic kit 2), it could not write successfully. It was stated that the program memory was not enough. 676 and 688 are really pin compatible but when I looked at the datasheet, 688 has a larger memory space. So I think the memory space matters in your project. Is there any way that I can change or vary in your code so that I can use my Pic16f676 for your project? It’s the only pic that’s closest to your pic that is available in our country. I have sent you the PIC16F676 version of HEX file in your email angel_joyce15 at yahoo.com. You should use exactly the same circuit shown in the article with PIC16F676, and load the new HEX file. Hello! Is it ok if I use Pic16f676 instead of Pic16f688? Please reply asap! Thanks! You can implement this project with any other PIC with ADC channels. PIC16F676 and PIC16F688 look pin compatible, but you can recompile the source code for PIC16F676 to make sure it will run. The measuring 0~30V going very well. I’m using 16f684 for this project & i’m still new in microcontroller world. 1 question, how can i sampling more than 1 analog input? 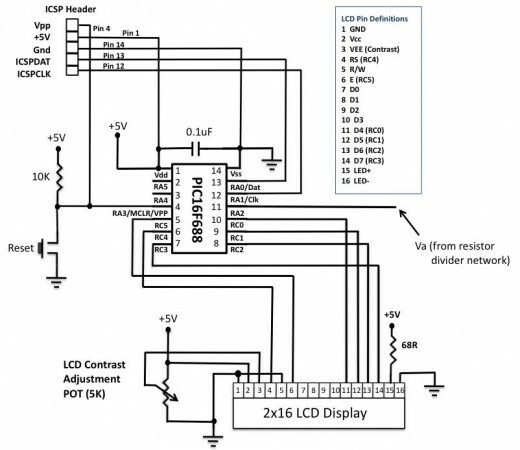 You can read analog inputs from multiple ADC channels but only one A/D conversion at a time. Suppose if you want to read two analog signals through RA0/AN0 and RA1/AN1 pins, you should first set their directions as input by TRISA = 0b00000011. Then you should also set ANSEL = 0x00000011. Now if you are using mikroC, you can read from AN0 using ADC_Read(0) and from AN1 using ADC_Read(1). I’ m thinking of combine this vdm with the temperature project, showing each reading altetnatively… Doesn’ t it feel great??? The circuit diagram explains what parts you need for this project. can you mail me the video of complete project of dvm u made. it will be helpful for me. Thanks for yr fast respond. Va = 0.2457* Vin, if max I/P voltage is 20V, so the calculation is 0.2457 * 20V & max. Va = 4.914V rite? So 20/4.914 = 4.07 correct? I’m calculating this math to have a 0~30V volt meter. Could you pls advise how U get the 4.07 in the below calculation? can u plz tell me how to measure(monitor) power continously using pic.i want to measure both voltage and current continously with some sampling rate. It would be little bit more complicated with PIC16F84 as it doesn’t have built-in ADC module and you have to connect an external ADC chip to it. There is no need of programmer after the program is loaded into the microcontroller. You just need to apply +5 V and Gnd in the circuit where required. ICSP stands for in-circuit serial programming, which is a technique to load the program inside the PIC microcontroller while the PIC is in the circuit. This way you can modify the program inside the PIC without taking it out of circuit. It is optional, but you need something to program the PIC. i have decided to design this DVM. I understood almost all connections but the only thing new to me is ICSP header. Why we use ICSP header in this project….?? I THINK THAT YOU ARE ELECTRONIC IC SOFTWARE DESIGNER AS YOU KNOW THE INTERFACING OF ELECTRONICS WITH THE PROGRAMMING. MAKET THIS PROGRAM TO WORK PLEASE. I am also using the demo version of MikroC that allows you to compile HEX code up to 2 KB. I would suggest to read the installation guide and user’s manual if you want to work with MikroC. and want to switch it between volt/current with the help of push button. soldering station work bench and Superpro 3000 Porgrammer. The file has has been updated. Sorry for pointing that to me, it was my mistake. I will link the correct file as soon as I get home today. 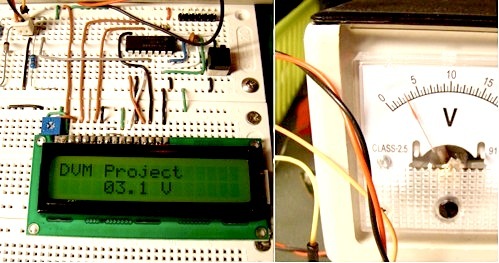 I refer to your project of Digital Voltmeter based on PIC16F688 OCT.10.2010. Can you please send me the hex File for this digital voltmeter. As I only get the Digital thermometer V2.zip file on the post. So far only simulates the Proteus. When finished I do post the pictures. Hello. Thank you for the reply. I modified the circuit as my needs. Dual Channel 0-70V. Gave relatively good resolution. You can send the pictures of your finished project, I can post them here, if you would like. What are the configurations of the fuses in MikroC? Thanks. I have added the information regarding the fuses in the software section. Thank you. I didn’t get what you mean by converting voltage and display as degree. If you are talking about reading the analog voltage from a temperature sensor and display as degree F or C, I would suggest to read my another project : Digital thermometer using an LM35 with a PIC micro. The underlying principle is same no matter what PIC you use. You need to find the new values for resistors R1 and R2 in the voltage divider network that could scale down the i/p voltage ranging from 0-30V to 0-5V. After that, just follow the math described above.